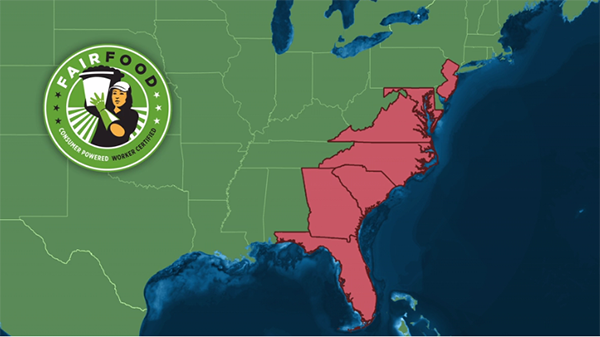 It’s official: the first leg of the “Behind the Braids” Tours hit the ground running in Georgia, Tennessee and Ohio this week, and today we wanted to bring you first-hand reports from the first wave of actions, presentations, film screenings, and gatherings of what will be two months of solid Wendy’s boycott action to come! First, though, we need your help: Whether you’re on a tour stop or reading this report from another corner of the Fair Food Nation, you can weigh in on the “Behind the Braids” action by supporting the students of Ohio State University, who are at a critical moment of their campaign to “Boot the Braids” off the OSU campus. Nearly two years ago, Student/Farmworker Alliance members at OSU met with Administration officials and reached an agreement — a signed agreement — that the university would end its contract with Wendy’s if the Dublin-based fast food chain did not join a proven solution to end the abuse of farmworkers in its supply chain and resolve the concerns of the Ohio State Student/Farmworker Alliance (OSU SFA). Today, as the deadline for renewing the contract between Wendy’s and OSU looms, Wendy’s has done absolutely nothing to resolve the concerns that led to the Administration’s promise. In fact, as most loyal readers of this site know well, the Dublin-based hamburger chain has done worse than nothing. 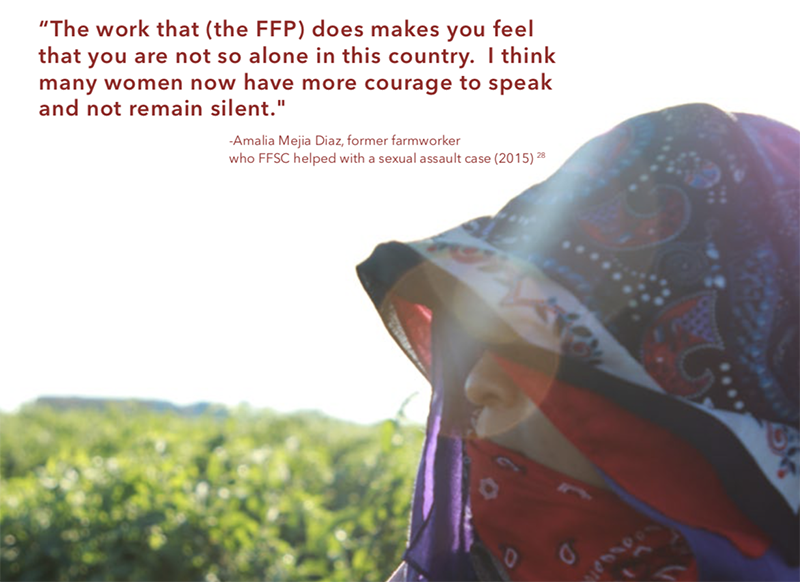 Not only has Wendy’s steadfastly refused to join the Fair Food Program (which most certainly qualifies as a proven solution to end the abuse of farmworkers in its supply chain), the fast-food giant decided to abandon the Florida tomato industry altogether, where workers’ rights are protected by the Fair Food Program, and shift its purchases to Mexico, where human rights violations are endemic and go largely unchecked. So, to coincide with today’s planned protest at OSU’s Wendy’s, students are calling for all Fair Food allies to send an email to OSU President Drake and CEO of the OSU Wexner Medical Center Dr. Sheldon – where Wendy’s is located – to not only listen to students’ concerns, but to deny Wendy’s a place on campus until the company’s leadership does its part to protect farmworkers’ human rights in their supply chain. Click here to support OSU students now — and share the action far and wide today! The ‘Behind the Braids’ Southeast Tour began bright and early Sunday morning in Nashville, as faith leaders of New Covenant Christian Church and Woodbine United Methodist Church welcomed CIW’s Nely Rodriguez to speak at their morning service on Wendy’s unconscionable moral failure in evading its responsibility to protect farmworkers human rights. 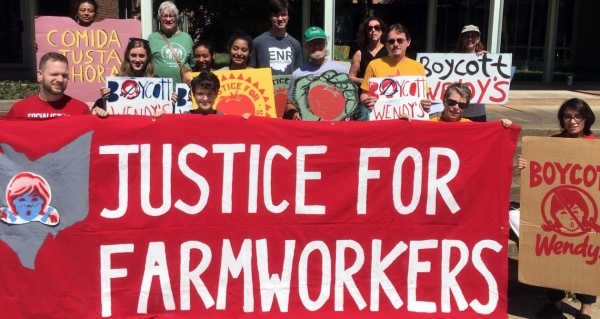 Later on that evening, members of Nashville Fair Food set up a convivio and art-building session to welcome CIW, and together, we inaugurated Fair Food fighter Brenda Ayala as the group’s first part-time organizer! We spent the next couple of days in classroom after classroom at Tennessee State University, Vanderbilt University and Trevecca Nazarene University, educating students on the CIW’s long history of struggling for human rights and strategizing on how to continue building support on campus this fall for the Wendy’s Boycott — and of course, animating students to take action on Tuesday afternoon! 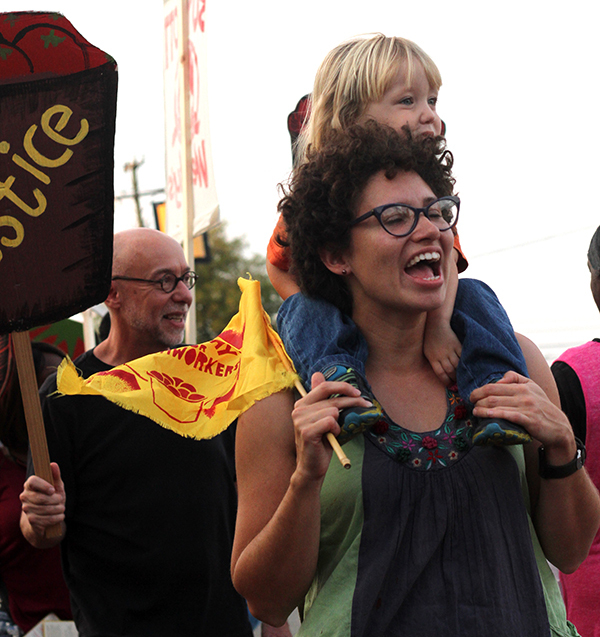 When action time came around, we were met with over 50 energized allies at Wendy’s right off of TSU’s campus – including stalwart members of Nashville Fair Food, Vanderbilt Food Justice, members of New Covenant Christian Church and the unstoppable Rev. 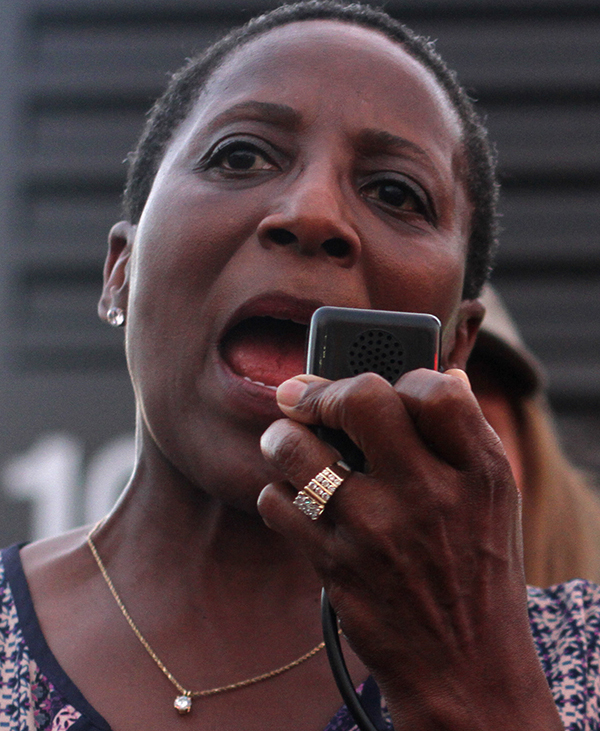 Dr. Judy Cummings, and of course, our friends from Workers’ Dignity – all of whom were fired up and ready to boycott Wendy’s! As boycott chants echoed throughout the highly-trafficked intersection and allies zipped through the streets passing out boycott flyers to passersby, a community delegation entered Wendy’s and delivered a letter to the friendly manager who agreed to pass it along to corporate. At the crack of dawn, the Immokalee team headed South for our next stop along the tour: the quaint, yet bustling town of Athens, Georgia. 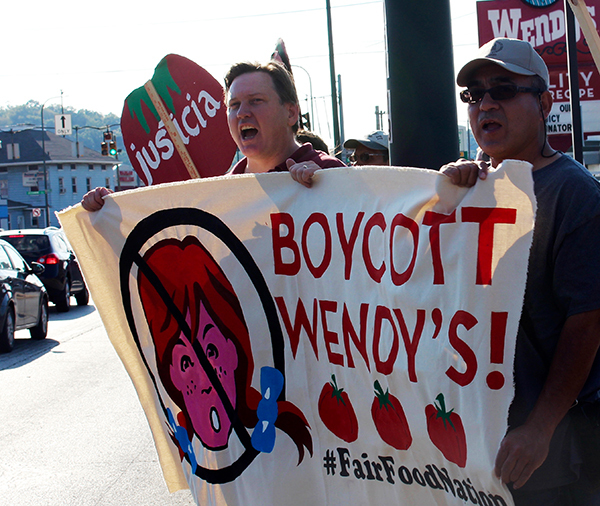 For weeks, a coalition of local organizations dedicated to creating an inclusive and unified community in Athens organized a full day of events to bring the Wendy’s Boycott to town. 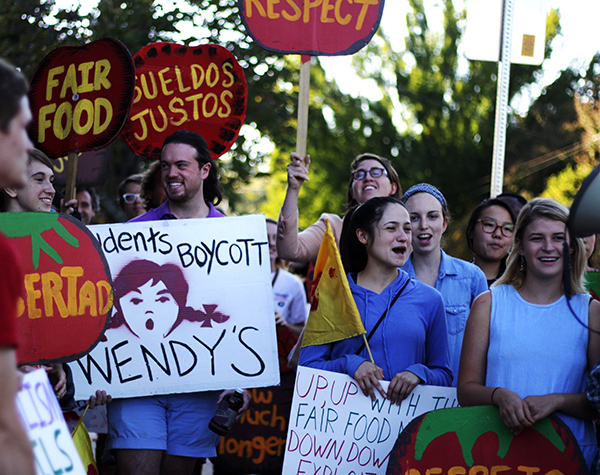 A series of presentations with professors and students from the University of Georgia’s Center for Social Justice, Human and Civil Rights and School of Social Work set the stage for a lively, creative Boycott Wendy’s march with dozens of newly-animated UGA students and community members. The high-energy march – led by members of Athens for Everyone, Real Food Challenge UGA, Amnesty International UGA, Daily Groceries Co-op and Bombs Away Collective – blasted the message of the Wendy’s Boycott to scores of people walking to class, heading in to work and even those leaving the Wendy’s drive-thru. 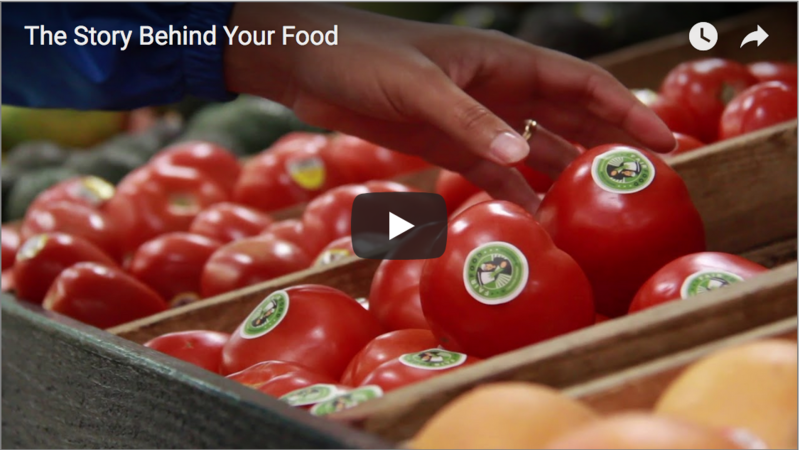 Finally, after the action, over 40 people attended a screening of the award-winning documentary Food Chains, including several Fair Food veterans from the days of the Taco Bell boycott! The day wrapped up with a special and savory community meal hosted by Bombs Away Collective to celebrate the tour stop’s success. 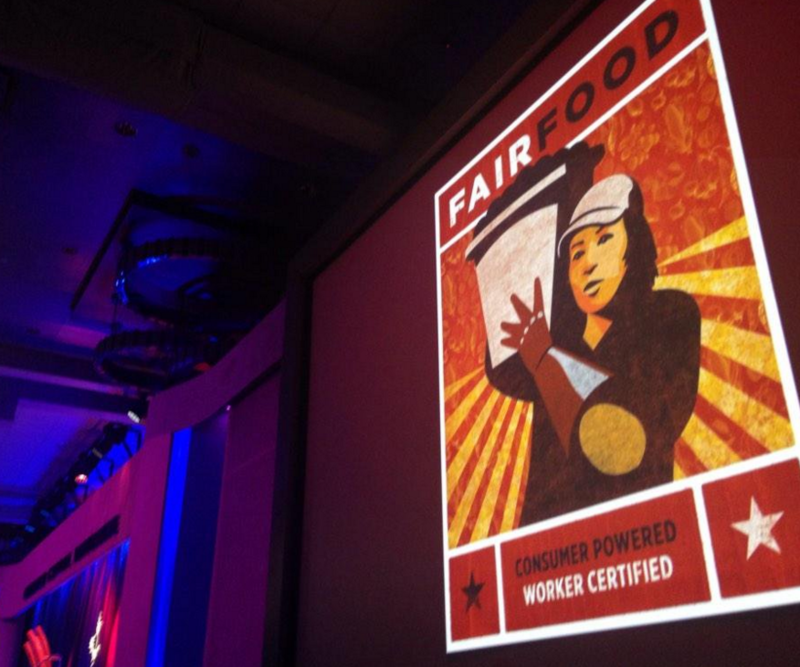 Our main take-away from the energizing visit: Athens is ready to take up the Fair Food banner in the Wendy’s Boycott! 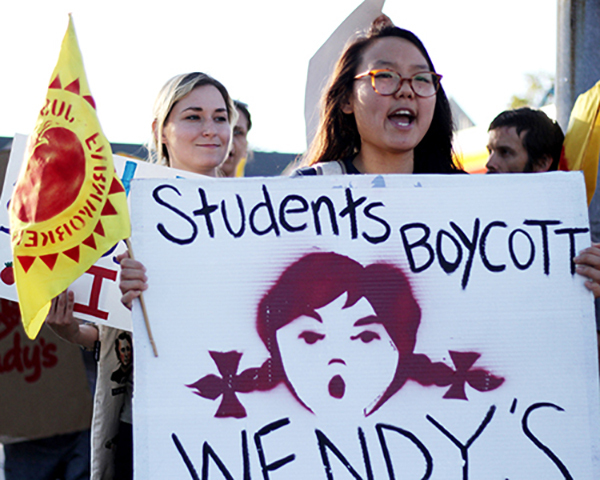 As the first Midwest arm of the ‘Boot the Braids’ tours took off on Monday, both farmworkers from Immokalee and allies in Ohio, Kentucky and Michigan had one thing in mind: bring the message of the Wendy’s Boycott to the heartland of the fast-food giant. Starting off in Wendy’s home state of Ohio, members of the Cincinnati Interfaith Worker Center, the First Unitarian Church of Cincinnati, the Greater Cincinnati Homeless Coalition and other local organizations greeted CIW members this past Tuesday with a warm welcome befitting of the Mid-South Queen City. 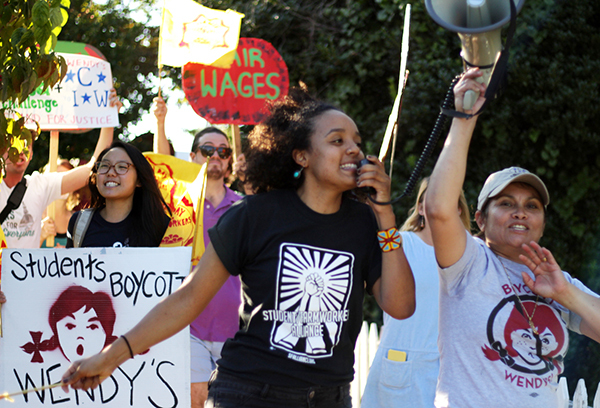 After an in-depth interview and call to action on the local radio station, La Super X, with hundreds tuning in, the CIW and CIWC headed off to protest at the Camp Washington Wendy’s, sending in a delegation of brand-new Fair Food allies to ask the manager to alert his higher-ups that the Wendy’s Boycott was growing. As the protest came to a close, the Midwest Immokalee team divided into two directions — one group headed for Louisville (stay tuned for next week!) and the other to Cleveland, where longtime allies in the Inter-Religious Task Force on Central America and students at John Carroll University joined us for a high-energy action in Shaker Heights. 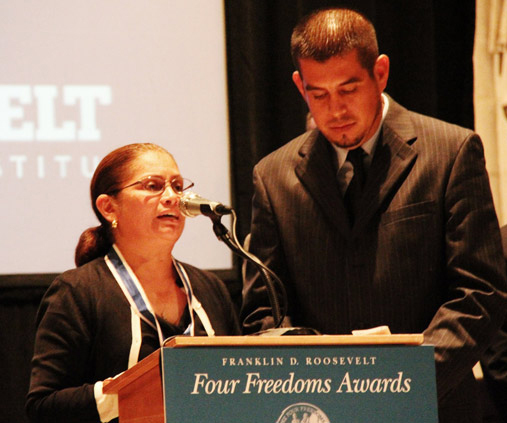 The action was buoyed both by IRTF’s tenacious commitment to solidarity with the CIW as well as people’s movements against injustice in Central America, and by John Carroll students’ budding excitement to organize on their campus. 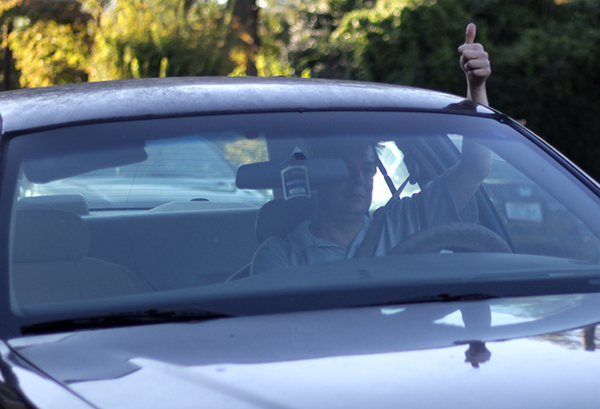 An unstoppable team passed out boycott flyers to hundreds of passersby, many of whom had pulled over out of curiosity. When a delegation attempted to enter the Wendy’s store, the manager refused to even accept a letter explaining why protestors were there — but the group, many new to the Wendy’s Boycott, left inspired to continue organizing in Cleveland to bring more and more people to support. 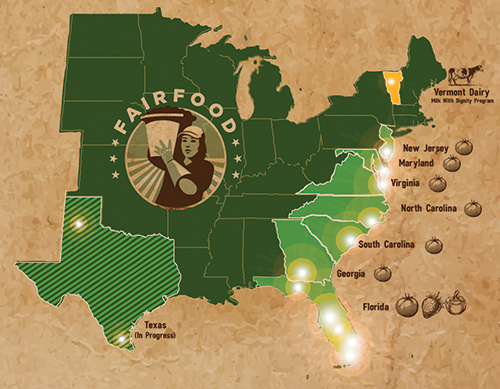 Friendly fire: Wendy’s shareholder takes fast-food giant to court for refusal to join Fair Food Program!